Like most children Angélique loves books which is fabulous because the whole family shares her passion. Reading to Angélique, however, requires concentration for she is, I believe, a child who seeks out detail. Before each storybook page has been turned Angélique will want to read beyond the words deep into the minds and hearts of each character. "What is he thinking?" she invariably asks or "how does she feel?" is another favourite question of hers. Angélique's questions probe deeper than her three years in my experience and make reading an intense and rewarding activity. If my daughter has a fondness for detail I love variations on a theme and so I have used this passion of hers to fuel one of mine. When Angélique enjoyed Goldilocks And The Three Bears I enjoyed finding different editions of the same story relishing the styles of each illustrator and picking out the small twists in the tale which made it differ from the other versions. Angélique's most cherished storybooks usually feature a big, bad wolf and Little Red Riding Hood is, unsurprisingly, her greatest love. For weeks now this daughter of mine has risen from bed and asked me to snuggle down beside her to share my version of this fairytale before starting the day. Every morning! Back in February when there was snow on the ground I found this old-fashioned Little Red Riding Hood fabric (which also exists in blue) and decided that I would turn it into a dress from this book for summer. I trimmed it with three 1940's red and white buttons and made two pockets from polka-dot red cotton. 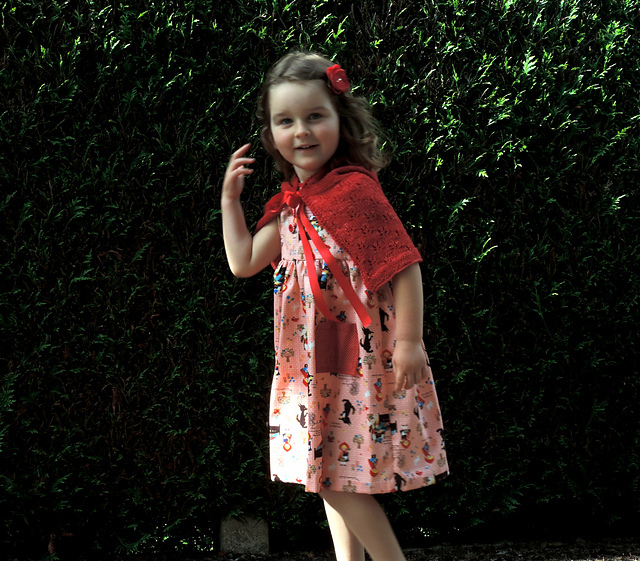 And then began the quest to find a knitted hooded cape pattern on Ravelry. Alicia Plummer's Spritely fitted my requirements perfectly and I fell for the undeniable charms of this version named Butterflies In The Melon Patch. I enjoyed the butterfly lacework which I knitted during my travels to England last week. The pattern, though simple, lacks the clarity of others, and I found myself having to use my head a little when stitch numbers did not add up. I also reached the conclusion that scarlet is not my favourite colour and that, whilst I love Madelinetosh sock yarns dearly, I cannot help but wonder why 'hand-dyed' is a good excuse for accepting a pricey yarn with a high number of white flecks in it? Does this strike you as an unreasonable thought? The past weeks have required a lot of family teamwork and detailed scribblings in various diaries to get through successfully. With one more exam for Héloïse to go we are reaching the end of the French school year with weary heads but smiling faces. It has been a beautiful year full of accomplishments and I am, like most parents, so very proud of my children. I have also been suffering from migraines again and backache so I am looking forward to an appointment with my osteopath this Monday. Thank you so much for your continued interest (and orders) on Facebook! I am currently working on a doll which, hopefully, should be ready this week. Finally, as may know, Google Reader will be closing on July 1st... hence the reason why so many are popping over to Bloglovin. If you would like to follow Millefeuilles over there please just click here. With the school holidays fast approaching I am hoping to write more frequently than my current fortnightly posts. Fingers crossed! Summer is waiting in the wings with costume changes, stage whispers, and bouquets. There is a spectacular, spine-tingling show of colour everywhere with, after the rainiest spring on record, a backdrop made up of a million green leaves unfurled. I would gladly call this paradise but there is something almost brazen or burlesque about this show the flowers are staging. If they could move they would probably strut and who could blame them? I am quite distracted by their beauty and as I stop and stare (and talk) at them I am reminded of the flowers of my childhood garden: snapdragons, columbines, phlox, marigolds, candytuft, canterbury bells, wallflowers, roses. The list of flowers my mother grew - and still grows - is gloriously long and I'm pretty sure that each one of those blooms had a face and a personality too. Snapdragons really do snap ferociously when you pinch their lower jaws and whilst some admire the lantern-shaped petals of the exotic two-toned fuchsia I see a graceful ballerina dancing. One early morning this week, made bold by the perky call of the cuckoo, Mickaël, Héloïse and I took the well-worn path, flanked with fluttering tall grasses, into the vineyards. It was a grey day and the sulky sky even managed to rob Héloïse's hair of its usual coppery glint. 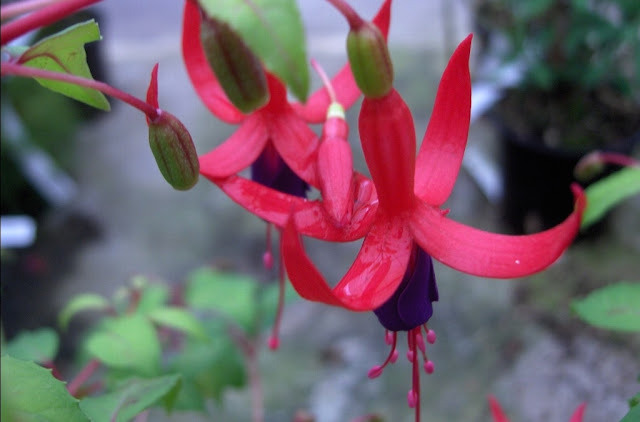 My mind has been filled with flamboyant colour, and flowers, these past days and I have found myself knitting in shades I would not usually favour; the violet and bright pink of a fuchsia. It turns out, I feel, that the clouds offered the perfect backdrop to this glorious riot of colour. Vintage Bouquet, by Dani Sunshine, is a beautiful pattern. I first fell for its charms when it was first published in May on one of my favourite knitting blogs, here and, having already enjoyed two of Dani's previous knits (you can see them here and here), I knew I was in for a good time knitting-wise! It's a flawless and simple pattern which offers the perfect dose of excitment with its flower petal-shaped lace and helpful notes on blocking too. Should you be interested my notes, as always, are on Ravelry. If you had been with us that morning in the vines you would have caught sight of Héloïse, bleary with sleep but brightly dressed in her last dance performance costume. And look at the pictures we took of her a year ago to the day! Please wish HéloIse luck for the 18th and 19th June when she will be sitting the first part of her Baccalauréat exams in French and History. I have so many things to share with you over the next few weeks but in the meantime I have just completed a summery mouse who is wearing very different colours to my daughter and who should be making an appearance over at Madame Millefeuilles this weekend! Once again I feel compelled to thank you all from the bottom of my heart for your generous, kind comments left on my previous post. You give me so much joy! ps I know Héloïse is a slender young lady but, my goodness, you should see how much she eats! One of the fascinating paradoxes of being human is that we are inescapably physical beings who yearn for transcendence. In other words, a well-balanced life should include both reason and a rapturous sense of wonder. Unfortunately, language really stumbles when emotions surge. We do not seem to have a precise vocabulary for complex feelings. How often have I found myself writing, 'words cannot express my gratitude', or, 'I cannot tell you how deeply touched I am'. It's frustrating. It's also, perhaps, the reason why many of us choose to create with a paintbrush or needle and thread. We use our hands to express the raw joy, love, and awe we experience when words fail us. Yesterday my nine-year old son Tristan performed in a room full of quiet people. He was playing a contemporary piece by a Breton composer for his guitar exam. He was serious and calm and his performance was moving. It is clear to me that Tristan plays music to express his gratitude for the beauty which surrounds him. Tristan and I cherish our regular bicycle rides uphill in the vineyards and along the gentle banks of the Loire. It's not just about getting out in the sunlight, feeling the breeze, and relishing the challenge of flying downhill and climbing up steep roads (he's much better at that than I am). It's about abandonning ourselves to individual sensations, savouring them until they vanish. A fortnight ago I took my mother out for an early morning walk during one of her precious visits. As she buried her nose in a hefty sprig of lilac she told me how much she needed to hold on to such moments: smelling until the nose quits from the abundance of scent. I understood her, of course. The ephemeral lilac has turned to rust now but it was beautiful while it lasted. Suddenly everything seems to be racing away too fast. We have sprung from spring to summer. I knew this was coming: this is our fourth year in Touraine. Abundant displays of wisteria are fading, the wild blue irises with smudges of violet stand tall for the time being, and poppies are everywhere. The familiar chirp of crickets will soon drown out the fading cuckoo. It's fast forward from now on and I am determined to go out on my bike and cultivate joy. Flowers deserve to be mulled over. Look to them for deeper truths. Their beauty may be brief but they can offer us a garden of memories. 'Stop Tristan', I shout as I see another elder tree in bloom. Most times, when he's too far ahead, I just screech to a halt, carefully cut a few luscious heads, and set off again. I'm on an elderflower mission these days. They are spilling over the banks of the river and I cannot leave them be. Our house is filled with their sweet, heady scent and I have dreamed of making elderflower fritters and trifle (both recipes are in Sara Paston-Williams' book Good Old-Fashioned Puddings). I'm distracted by scents these days. All of nature is lush with romance and I simply want to join the party. The power of scents to evoke vivid memories has long been a favourite device of novelists and poets. Proust’s Remembrance of Things Past opens with the most famous ‘olfactory flashback’ in literature, when the sweet aroma of a simple little cake releases several hundred pages of childhood memories – or what Proust calls ‘the vast structure of recollection’. Vanilla is all about childhood memories, I believe, and they are almost invariably positive – sweet treats and rewards, ice-cream holidays, innocent pleasures. For me vanilla conjures up the exotic locations where its beautiful flower is cultivated under the warm sun. I often split a vanilla pod and add its precious dark seeds to a simple buttery cake. My children love it too. I simply had to include a saucy picture of her bloomers mainly because I am quite smitten by the lace which trims them: it dates back to 1890! I was a little sad to see Mademoiselle Vanille go but, lucky girl, she is on her way to Ireland. I had such fun embroidering those exotic flowers and I had a vanilla pod beside me as I worked which I would occasionally sniff. The pod in question ended up in a pot filled with pudding rice, creamy milk and light brown sugar which lightly simmered for an hour. I broke three eggs, gently beat them in and then baked the rice pudding in a cake tin for half an hour. I made a caramel sauce with Breton salted butter. It's a very simple French recipe which comes from a stunning book of an author's favourite dishes: more on that at a later date! As Chaucer said, 'This world is but a cherry fair'. To quote Katherine Swift in The Morville Year: "Cherry trees have always been synonymous with the brevity of life, not only because of the fleeting nature of their blossom, but because of the short season for their fruit. The sight of them, like the taste of the wild fruit, can be bitter-sweet." Tristan has grown to love the wild orchard which is off the well-worn track we favour through the vineyards. Sometimes we stop to rest there, kicking off our shoes, and even singing occasionally. Now the green cherries, hanging in abundance, have a rosy tint. In a couple of weeks it will be time to pick them. I know that when these fruit are ripe I will be off with my basket and children to pick them and savour them. Happy days! Freshly created to bring in the month of June. I'm dreaming of making cherry jam and clafoutis dusted with icing sugar. 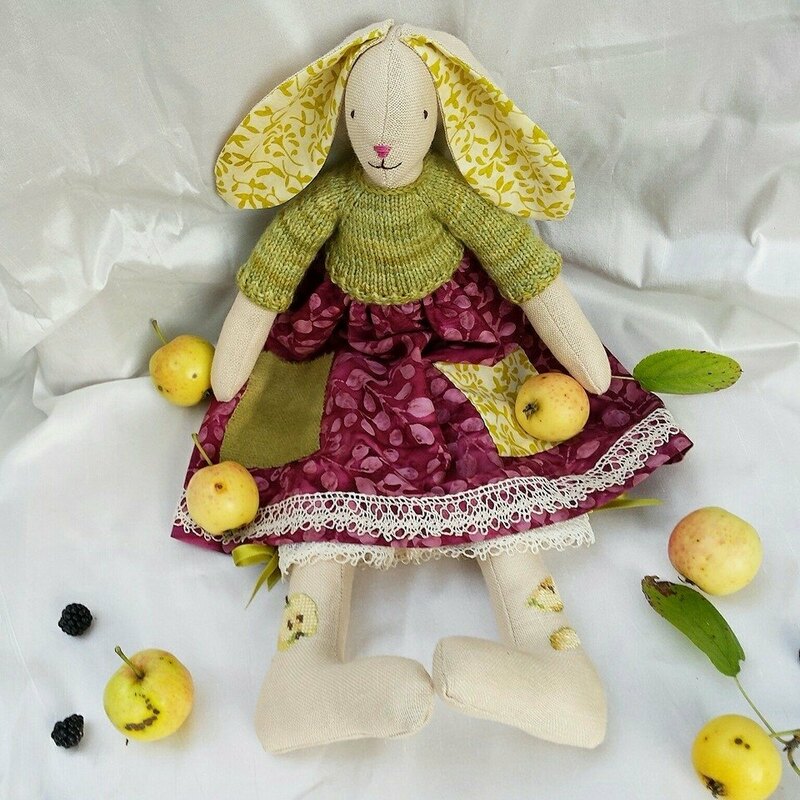 Mademoiselle Cerise has a handstitched and embroidered bag which she will fill with cherries when the time comes. And look! She's wearing bloomers too! If you would like to take a closer look at her, you may find her here. I am left wondering how long I will continue making these little creatures which offer me so much joy? I am so grateful for all your generous comments on my last post. Each and every one of you has given me pleasure. Thank you!